“As a singer, and someone that chooses to devote their life to a career in music, there are few things in life that can compare to experiencing a recital given by two truly spectacular artists. When those artists are people with whom you work closely, the thrill is second to none. On the 21st April, the audience at St John’s Smith Square, London gathered to listen to a recital given by Nelly Miricioiu and David Gowland. Although the two had never performed together before, it was apparent from the start that this would be a match made in heaven. Having been asked to write an account of the evening, I want to make it clear that this is not a review, but instead an insight in to this beautiful display of artistry, and passion for music, for those who were not able to attend. As someone who is very close to Nelly, I had had the great honour and fortune to be given access to earlier rehearsals for the recital, witnessing the complete dedication and exploration that she goes through for months before. As her student, and friend, it is easy to be bias, and I know that I will always enjoy her work. However, even I – and, by all accounts, many others – could never have known quite how incredible this evening would be. As you sit in the audience, you see an artist to whom few can compare, showing that if one is prepared to continue learning and exploring, and working until you bleed, there is nothing that cannot be achieved. The first half of the recital was entirely song repertoire, both known and lesser known. The courage to expose the audience to repertoire that is perhaps not familiar to them highlighted two things to me. Firstly, that Nelly is not an artist who relies on past experiences, views, technique or an assumed adoration from her public. 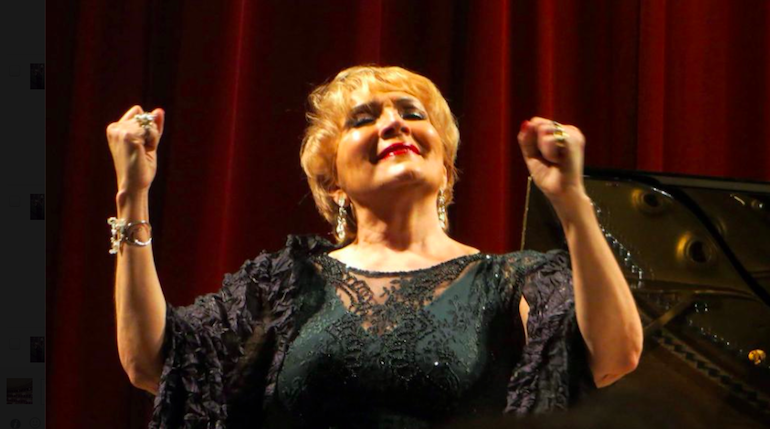 Instead she is an artist who constantly works on her own vocality, learning and exploring every day in order to serve the composer, and her own connection to the music, in the best way possible. Secondly, the programming of such varied repertoire shows a trust and belief that her audience can be open to the exploration of a world of music that they may not yet know, and that they will be open to the possibilities that this may bring. The relationship with her audience is clearly of great importance, and the dialogue and warmth she engages with them is something that few others do – the love and respect they have for her is tangible, and it was clear that they were captivated. The repertoire included Ravel, Chausson, Chopin and Viardot, Brediceanu and Respighi. These particular choices allowed the formation of a truly beautiful musical relationship between Nelly and the wonderful pianist, David Gowland. Both artists created their own beauty, whilst intertwining with the other to produce magic. Ranging from the unique, slightly crazy arrangements of Chopin pieces, to the comforting Romanian songs by Brediceanu – a clear homage to the heritage of which she is visibly proud – , and through to the fiendishly difficult cycle “Deita Silvane” by Respighi, this was an example from which all performers can learn. She brought to the music a vocality displaying a world of experience in both operatic and song repertoire, allowing her voice to move gracefully between each piece, never losing the combination of intensity, fragility and passion that is the envy of those of us who aim for this in everything we sing. Following a well deserved break Nelly and David returned to the stage for the second half – this time an exploration in to some of the most beautiful, and again tremendously difficult, operatic repertoire. This was a breathtaking journey (literally if, like me, you held your breath due to the sheer excitement of what I was witnessing) that brought Bellini, Rossini, Puccini and Verdi – just a handful of composers for whom Nelly is renowned for interpreting. David played the full introduction of Bellini’s “Col sorriso innocenza”, setting the scene for an exquisite second half and reiterating the importance of having such an experienced, sympathetic and inspired “orchestra” at the piano. Each aria showcased Nelly’s enviable technique, from the coloratura and ornamentation – the likes of which I have never heard done so brilliantly – of Bel Raggio Lusinghier, through to the heartbreaking, intimate pianissimi achieved in Puccini’s Ch’il bel sogno. Many people expressed their admiration that Nelly does not hide the work involved in achieving such spectacular quality. Whilst it must appear as second nature, which of course it does, it is also possible to see the work that is necessary to achieve this – and why shouldn’t the audience be welcomed in to this? She is a conduit for this music, and it is important for an audience to feel part of the experience, not merely observe. The excitement of watching Nelly as she achieved the spectacular high notes that she did, and to see the way each piece so obviously affects her, is a privilege. I wondered what it was about the evening that had affected me so deeply. Having seen the early stages of the recital, and knowing Nelly and her voice, I knew that this evening was going to be special. Yet, somehow, I was not prepared for it to be quite as beautiful as it was. Speaking with others, and exploring my own reaction, I realised what it was. Nelly is always herself on stage, yet she is always completely in character of the role she is performing. She is never trying to be someone else, but is instead a total representation of that character within herself. As her student, of course you grab every opportunity to see your maestra in action, but more importantly we long to see an artist in action – and we could not ask for better. The audience was formed of those who love and support Nelly and David but, notably, of people who respect and admire them both. It was wonderful to see so many colleagues from the profession in the audience, alongside friends, the fans who continually support her, and also many people for who this was a new experience. The evening was ended with two encores; Adriana Lecouvrer and Vissi d’Arte – two of Nelly’s trademark roles. Following Adriana, Nelly spoke – visibly moved – of her gratitude to the audience and those around her. Her obvious love and passion for all things artistic and human was reflected in Vissi d’arte, the realisation of life in art, and brought the audience to their feet.